This paper reports on optical and X-ray observations of the pulsar PSR J2144-3933. As discussed in a previous Astrobite, pulsars are rapidly rotating and highly magnetized neutron stars. Because the axis of a pulsar’s magnetic field is not aligned with its rotation axis, the beam of radiation emitted from its magnetic poles rotates with the pulsar. If this radiation beam is aligned with Earth, we then observe a series of radiation pulses (illustrated, for example, in this animation). Figure 1: P-Pdot diagram. The death line is indicated by the dashed blue line. PSR J2144-3933 is indicated by the large star. Pulsars are characterized by their position on what’s known as a diagram (Figure 1). In this diagram, the pulsar period is plotted against the rate of change of its period (both of these characteristics are usually observable to very high precision). Lines of constant magnetic field strength ( ) and characteristic age ( ) are also indicated on the plot. Pulsars are typically born with fairly small rotation periods and large slow-down rates. They initially evolve along lines of constant , but their slow-down rate gradually decreases and magnetic fields become weaker until they cross what is known as the pulsar death line, shown as a blue dashed line in Figure 1. The pulsar death line marks the transition into the pulsar graveyard. In this region, there is usually no further radiation detected from the pulsar — although it’s unknown whether this is a result of the radiation mechanism switching off after a pulsar crosses the death line, or whether the radiation just becomes so weak that we can no longer detect it. 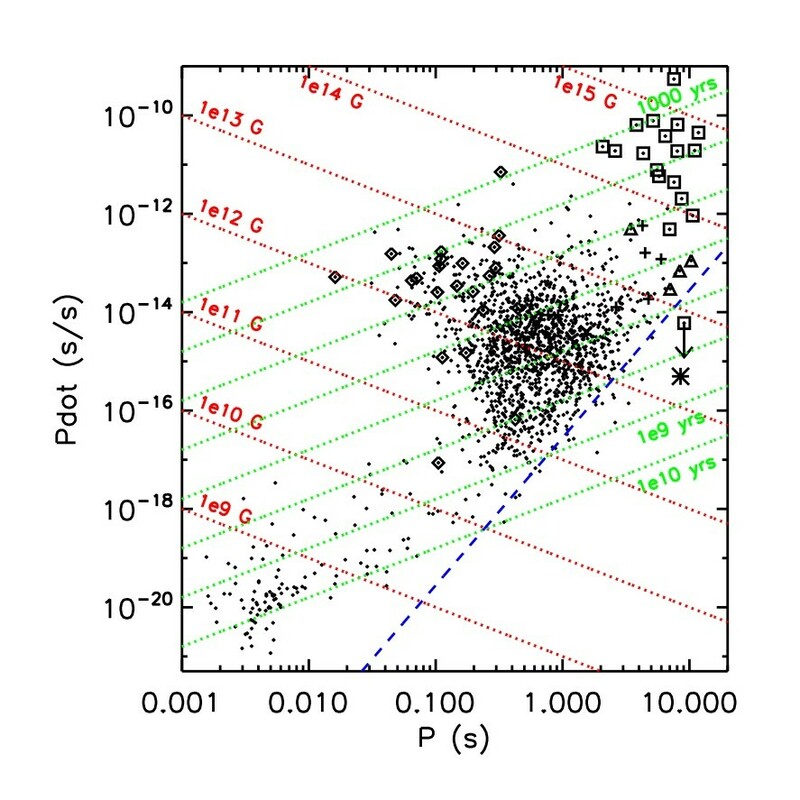 A glance at the diagram shows that PSR J2144-3933 (indicated by a star on the diagram) is an unusual pulsar. With a period of 8.51 s, it is the slowest-spinning radio pulsar that has been observed. It also has the lowest rotational energy loss (given by and exists farthest below the pulsar death line, challenging our understanding of this region of the diagram. And though PSR J2144-3933 is located a distance of only ~170 pc from Earth, making it also the closest isolated (i.e., not a member of a binary system) radio pulsar known to date, it has never been detected outside the radio waveband. In this paper, the authors describe the results of the first deep observations of PSR J2144-3933 in the X-ray and optical bands with XMM-Newton, an orbiting X-ray observatory, and the Very Large Telescope (VLT), an array of four optical telescopes located in the Atacama Desert in Chile. The observational results are shown in Figure 2; the X-ray observations are in the panel on the left and the optical observations are in the panel on the right. 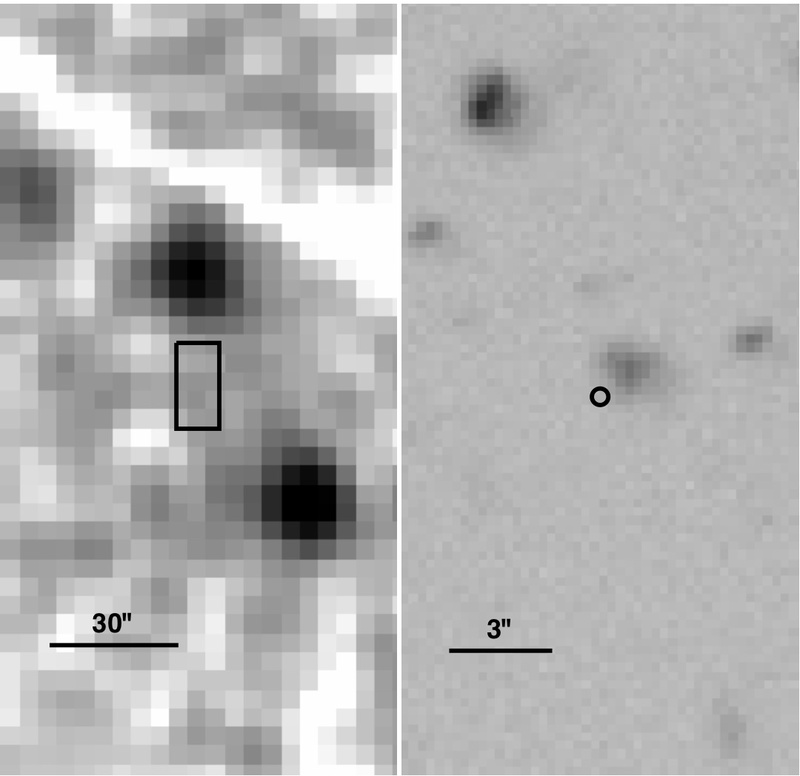 Figure 2: Left panel: XMM-Newton image of the ~1.5'x3' field around PSR J2144-3933. The 10"x20" box indicates the sky region shown in the right panel. Right panel: VLT B-filter image of the ~10"x20" field around PSR J2144-3933. The pulsar is marked with a circle. If you don’t see anything in these data, you’re in good company — the authors didn’t either! But this is a great lesson about science: null results are still results. The authors use this non-detection of PSR J2144-3933 in the optical and X-ray observations as a means of placing upper limits on its temperature. They find that if the pulsar had a radius of 13km, its surface temperature would be limited to . Furthermore, the maximum temperature of a hypothetical 500m-radius hot spot on the pulsar would be . They also calculate the maximum luminosity of the pulsar non-thermal emission based on their non-detections. The authors concede that the limits they determined may not tell us much about the general population of pulsars, given how unusual PSR J2144-3933 appears to be. Nonetheless, they argue, this upper limit on the surface temperature of the pulsar is very robust and is one of the lowest ever obtained for a neutron star.